The London Natural History Museum has a new and very exciting new addition to its already many wonderful galleries, The Darwin centre. The new state of the art space was open in Summer 2011 and already it is one of the most popular areas of the museum. This is probably because it is so interactive and gives the visitor the feeling of being allowed behind the scenes. So What Is the Darwin centre? Well it’s a state-of-the-art science facility which includes thousands of specimens from all aspects of the natural world, most of these collections were in the past kept and worked on behind the scene. These collections are now available to view by the general public. World-leading scientists work at the Darwin centre and are often available to answer questions from the public. This is a rare opportunity and makes this area of the London Natural history Museum a very special and valuable place. This is both a gallery for the viewing public and a working facility, with world important experiments being carried out for both now and the future of the planet and the human race. 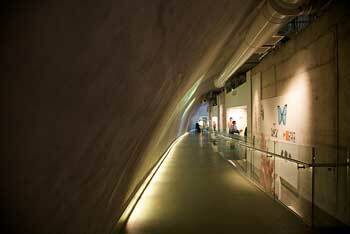 Within the centre there are also several other interactive areas, the cocoon, the Attenborough Studio and the Angela Marmont Centre. 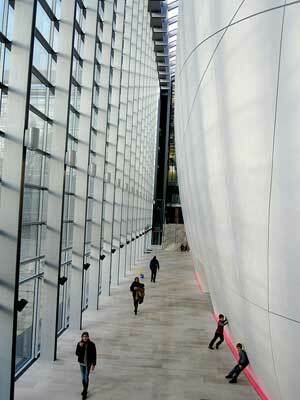 A giant Cocoon dominates the middle of the Darwin centre. When I first saw it i stood there amazed, It is both awe inspiring and beautiful. Just seeing the cocoon is on its own worth a visit to the centre. Entry to the cocoon is free and takes you on a self guided interactive tour down two floors inside the cocoon. You will see fantastic displays of specimens not before shown, from Tarantulas to meter high plants. Video screens and virtual guides help you to discover the many fascinating objects and specimens within the gallery. Entrance is free to the studio. This is a really new and exciting edition to the London Natural history Museum. A 64 seat auditorium will take you on a high tech interactive trip into various aspects of human and animal life and evolution. This video is a trailer for a great 50 minute interactive film shown at the Attenborough Studio. This is a fantastic opportunity to see a state of the art film for FREE. This centre is for UK Biodiversity. This is where the scientists carry out many of their experiments and work. The public are able to view some of the scientists and some of the collection through viewing windows cut into two alcoves in the outer cocoon building. The Darwin centre within the London Natural history Museum is not to be missed and I will certainly make it one of the first things I visit the next time I am at the museum. Don’t feel that you have to do it all though as there simply won’t be time enough on your day at the museum. But dipping into a little of everything will give you a great feel for the museum and wet your appetite for the next time you visit.